“I don’t actually consider myself a jewellery person” says Anna-Marie Solowij, co-founder of the website and Topshop concession BeautyMART, which brings together a curated offering of beauty products one 'can't live without'. 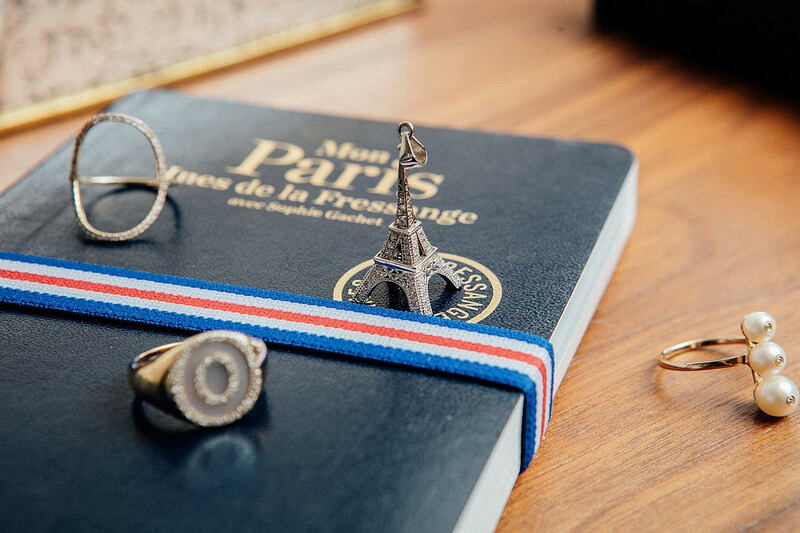 Her eclectic collection, stored in beautiful lacquered boxes that were once home to exclusive beauty products, are not the result of a passion for jewellery. They are a collection of memories, kept by a self-confessed hoarder. “It’s an emotional thing.” Solowij says, as she points to an engagement ring given to her by a man she never married and a little silver ring, the first piece of jewellery she ever owned, now bent out of shape. Digging around for hidden treasures, in her North London flat, with her rescue dog closely at her feet, Solowij tells us about her career in beauty that has spanned four decades and why she might finally give in to getting her ears pierced. How did you career start? I got my first job at a magazine when Marie Claire launched in 1988. My brother was friends with Glenda Bailey who was the editor. She knew I was really obsessed with fashion as I had assisted her on multiple shoots. She needed someone organised, who knew how an office was run so she offered me a job as PA to the fashion and beauty directors. The directors had offices on opposite sides of the corridor and I would run between the two departments with my notebook. What made you choose beauty? I was more excited about fashion at first. Labels such as Issey Miyake and Jean Paul Gaultier were beginning to emerge and I wanted to be part of that world. But there were already five people in the fashion department so I was very junior. The beauty department on the other hand consisted of the editor and me. She needed support so she encouraged me to write and style shoots. After eight months, I was made her assistant. I was delighted, I still got to pull clothes for the shoots but I also got to work with all the new beauty products. I was fascinated about the science behind skincare and the artistry behind make up. I spent two years at Marie Claire before moving to Elle for six years and then Harvey Nichols magazine for three years after that. That led me on to freelance for various other publications including In Style. Whilst there, I received a call from Vogue inviting me to their office for a chat. They offered me a job as beauty editor. 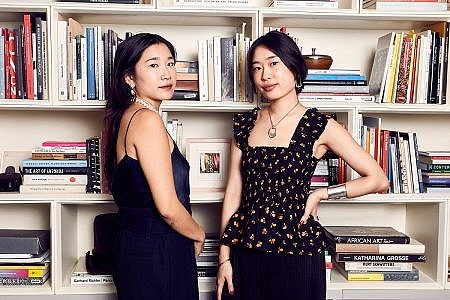 I didn’t ever think I would be at Vogue, I felt I had had my time at Elle but I took the job and spent six years there. It was the perfect finishing school before exploring the commercial side of the business. What was your route into the commercial side of beauty? I began to consult for brands. I knew the finished product, I had been working with it for years. The challenge was to think about the path to success. Packaging design, formula, marketing plan, retail strategy, who’s involved creatively, where it’s made, the price point and the customer are all things that have to be considered. How did the idea for Beauty Mart come about? I was writing a piece for the FT about how nobody was addressing what we now refer to as the millennial customer. When the recession hit, people started to demand more transparency, they wanted to know the true cost of goods and they wanted value for money. Young women started to shop across price points, they weren’t just buying one brand anymore. I emailed a friend in the industry, saying ‘you need to do something about this’. She emailed back saying ‘I want you to do it’. I phoned Milly, who is now my business partner. Two years later we launched Beauty Mart. To offer the best beauty products on the market and give our customers information they can’t get elsewhere. It is not the brand’s own voice. It’s not the voice of a magazine. It’s our own voice, and it comes from our own experience. How do you pull together your clothes, beauty and jewellery? I start from the feet upwards. How long I have to be on my feet will determine the shoes, which will determine the clothes. Then it’s my make up. I don’t spend more than ten minutes on this. I don’t do much with my hair either - I tie it back in a ponytail. (Since my hair went grey I get away with being lazy. The grey is the message that people see first.) Then it’s the jewellery. I would say ‘unshowy’. “For me, jewellery is a ‘hidden detail’. I dress for other people but my jewellery is just for me. I wear things as much for the story as for what they look like. It’s an emotional thing. I’ve got some complete horrors in my jewellery boxes that I’ll probably never wear again but they meant a lot at one time in my life. I’m also quite practical & that is reflected in my attitude to jewellery. It’s one of the reasons I never had my ears pierced. The ‘single earring’ trend is enticing me to get my ears pierced. I love an asymmetric look. I saw those big earrings from the Jonathan Saunders runway and thought I want those! A friend bought me these screw back earrings (above) when I turned 40. She said, “when you get older, you need that bit of light around your face”. She is right, a good pair of earrings can illuminate the skin and accentuate your jawline. That also might make me take the leap. 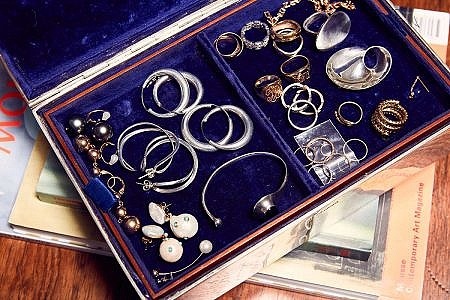 What is the most sentimental piece of jewellery you own? My mum and dad’s wedding rings that were melted down and made into three rings for my two sisters and I. We all wear one which is really special. What is the latest addition to your collection? In the summer I went with some friends to Sicily for a holiday and we found this brilliant vintage shop. I got the most gorgeous great big pair of pearl clips. They’re from a 1960s designer. What is your top jewellery tip? I own a lot of leather jewellery like these Acne cuffs. I keep them in a rose scented box (above) so the leather becomes infused with the scent. You can wear them instead of perfume.